Today's Draw: Bee from the Druid Animal Oracle. How kindly do you treat the Safeway checkers, burrito makers and "grease monkeys" of this world? How do you serve the public? And how quick are you with encouragement or a kind word? Today's card comes from an oracle deck, so I'm veering off the tarot course, as I do from time to time. 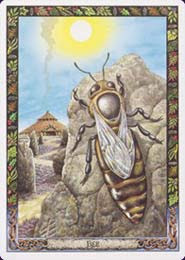 The book for this deck says that bee speaks to community, celebration and organization. When I think of bees, though, I usually think of how they can sting you if you swat at them. For most, they're a nuisance. But bees really have a lot to teach us, primarily about service and the value of things we take for granted. Probably since my 30s, I've devoted some time to service. Service doesn't have to be volunteerism per se. It can be anything that serves others. For example, I consider the time I spend writing my blogs to be service, because I know they help others. And, like most service, they also help me. We like to think of service as a selfless act, but in my experience it pays back richly. I spent a number of years as a literacy volunteer. I never actually taught anyone to read, though. One of my students was learning English as a Second Language, and all the rest were preparing for their GEDs. The ladies in the halfway house who were trying to get their GED taught me the most. They were there, not by choice, but by court order. Street people. Crack addicts. We look at them much like we look at bees...they're a nuisance. But what they are is wily enough to survive for years in circumstances we couldn't even bear for a week. Come the apocalypse, they are who you want on your side. While service is something humans do in our spare time, it's a 24x7 thing for bees. You never see a bee kicking back, do you? If they're not pollinating crops, they're making honey, generating beeswax or feeding the queen. And to what benefit? Well, they get to live. But it's not like bees get vacations or anything to look forward to. One-third of the total human diet is made up of insect-pollinated crops, and bees are the world's pollinators. They work in an organized, cooperative manner. They have a clear purpose in life that they are razor focused upon. They are loyal to their queen. They live their lives to serve. Anyone would be proud to contribute that much to their community. And we swat at them, as though they have no value at all. What I learned from my years as a literacy tutor is the same as you can learn from bees. Everyone has their place and value in this life. One of my pet peeves is when someone calls another person stupid. There are many different kinds of smarts in this world. When a lawyer's Mercedes breaks down in the middle of nowhere and they wait two hours for hours because their radiator ran out of Evian, who's smarter...the lawyer or the roadside assistance guy? When an executive goes a day without electricity waiting for the handyman to come and flip the circuit breaker, who's the one who deserves the corner office? We all make judgments. And we tend to do it as if our way is the better way. But the Safeway checker who takes forever looking up a code may have a much more successful home life than you. The exotic dancer might be studying for their MBA. And the barista at Starbucks might be making ends meet each month with zero debt, while you earn 5x as much and are buried in credit card bills. Meanwhile, without these people, you'd be checking out your own groceries, making your own lattes and twirling your own pasties at your bachelor party. Speaking of baristas...a few years back on Christmas day I was out and about for some reason and saw the Starbucks was open. So I stopped in for a chai latte. And I said to the girl behind the counter, "thank you so much for coming in on your Christmas day to serve us. We could have lived without Starbucks today, but I'm glad you're here." She got all emotional and said I was the only one who had said that all day. You know, we all just want to be appreciated for the role we play. We want to be recognized for our special kind of smarts. We want our place in the world to be acknowledged. We want to know we're valued. We want to be proud of what we do. If you don't know how to serve others, start there. Tell someone what a good job they're doing. Or how much you appreciate that they're there everyday. Or even just smile and say "have a great day". Truth is, you need them to operate in this world. You'd better be grateful. We all, no matter what we do, fit together like a huge machine that keeps the world going. None is more important than the other, though society tells us that money is the measure of worth. But consider that the real measure of worth is grace in service...no matter what it is you do. See if you can take grace and service into your job today/tomorrow. See if you can recognize it in someone else. And see how it can change your heart, your mind, your judgment, your viewpoint and the way you move in the world.